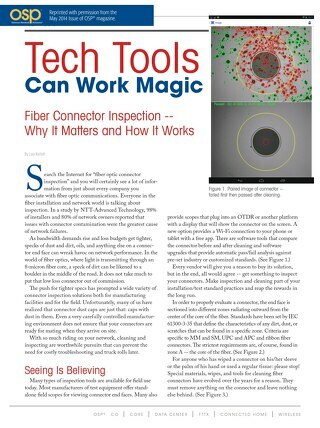 Pre-terminated fiber-to-the-“x” (FTTx) solutions have existed in the marketplace for some time now with many “plug and play” fiber access terminals employing flat drop style cables. While these cables provide many advantages, including self-support capability, their primary use in aerial applications is in a lashed cable infrastructure. 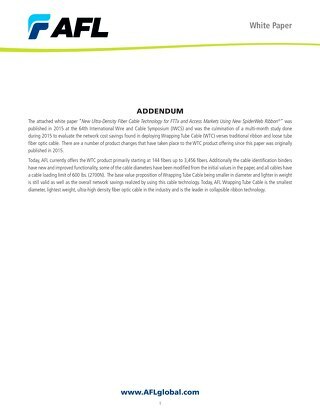 This paper investigates the use of alternative cable stub options and how they could be used to lower overall deployment costs in a new era of FTTx deployments. 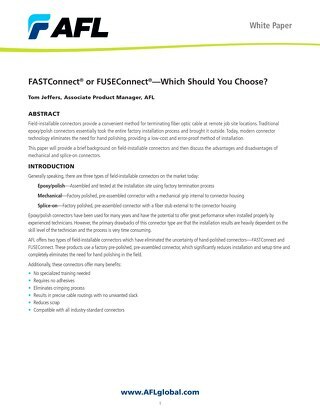 Will Miller is a Product Manager for Outside Plant Connectivity products at AFL. Will has over 10 years of experience in fiber optic cable and connectivity installation and manufacturing. His experience includes field engineering, applications engineering, and fiber optic cable product management. 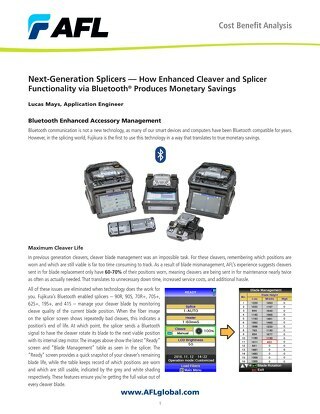 Cost study: Compared to a traditional splicer-cleaver combination, a Bluetooth-enabled splicer/cleaver combination produce a 76% cost of ownership reduction and weeks of time reclaimed. 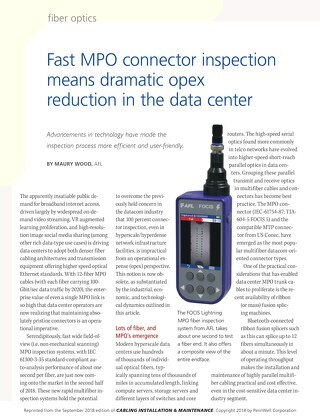 AFL's Maury Wood writes contributing article for Lightwave Online on how fast MPO inspection tools meet the critical need of the rising demand for internet cloud services. 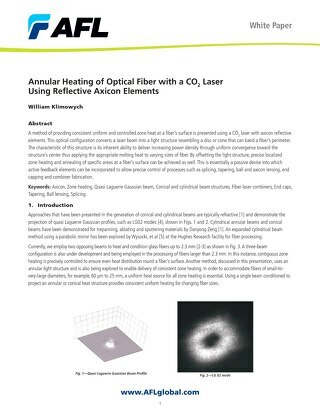 Demonstration of low attenuation metal-coated optical fiber and cable capable of withstanding temperatures up to 500°C. 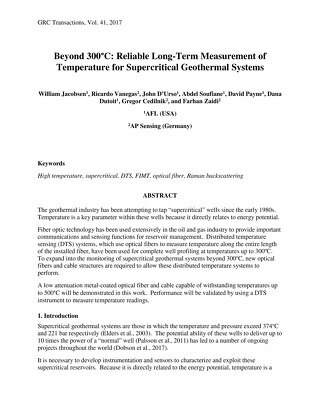 Performance will be validated by using a DTS instrument to measure temperature. 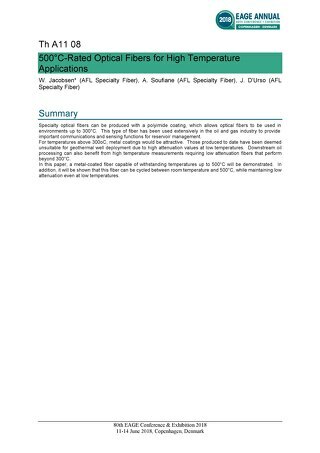 This paper will demonstrate a metal-coated fiber capable of withstanding temperatures up to 500°C. 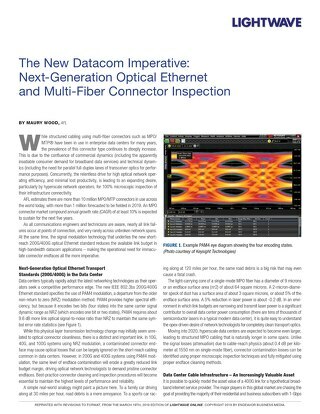 Fast multifiber connector inspection using new tools is now feasible even for hyperscale data center operators, with compelling operation expense reduction. 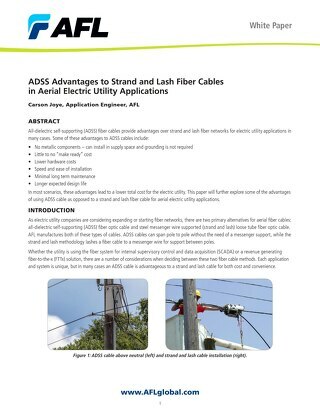 This paper will further explore some of the advantages of using ADSS cable as opposed to a strand and lash fiber cable for aerial electric utility applications. 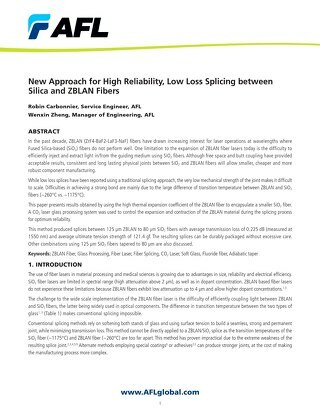 This paper presents results obtained by using the high thermal expansion coefficient of the ZBLAN fiber to encapsulate a smaller SiO2 fiber. 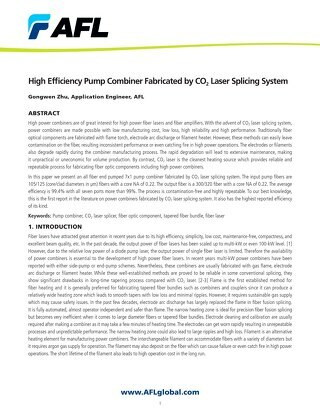 In this paper we present an all fiber end pumped 7x1 pump combiner fabricated by CO2 laser splicing system. 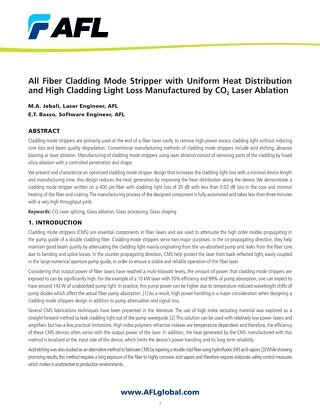 Presented and characterized are an optimized cladding mode stripper design that increases the cladding light loss with a minimal device length and manufacturing time. 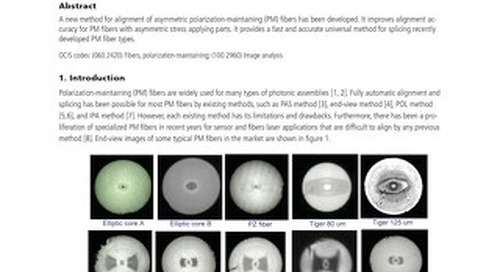 In this paper, general ball shaped end-caps are studied and illustrated. Different ball shaped end-caps were tested and measured for a variety of applications. 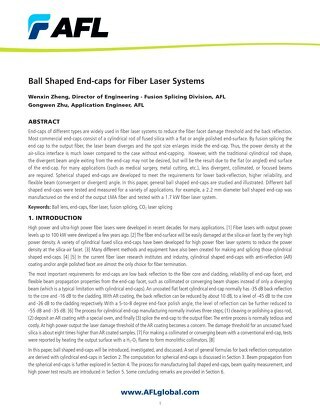 By offsetting the light structure, precise localized zone heating and annealing of specific areas at a fiber’s surface can be achieved as well. 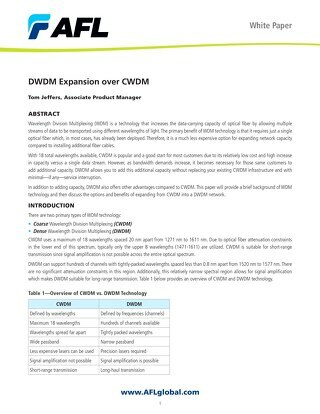 DWDM allows you to add additional capacity without replacing your existing CWDM infrastructure and with minimal—if any—service interruption. 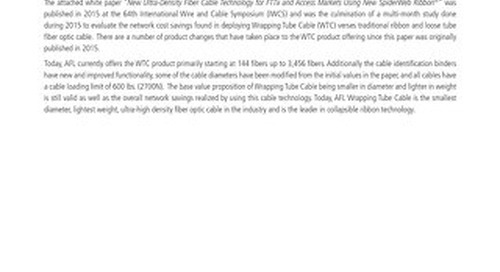 The new ultra-density fiber optic cable technology, called Wrapping Tube Cable (WTC), utilizes a new optical fiber ribbon arrangement technology called SpiderWeb Ribbon (SWR®). 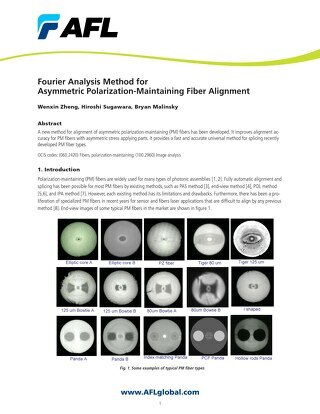 The new method for alignment of asymmetric polarization-maintaining (PM) fibers improves alignment accuracy for PM fibers with asymmetric stress applying parts. 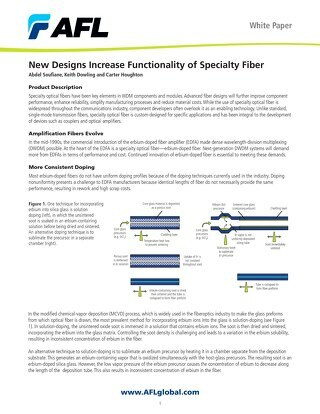 Advanced fiber designs will further improve component performance, enhance reliability, simplify manufacturing processes and reduce material costs. 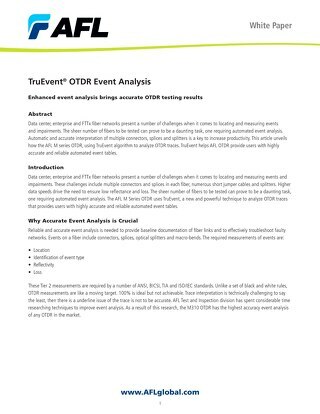 TruEvent helps AFL OTDR provide users with highly accurate and reliable automated event tables. 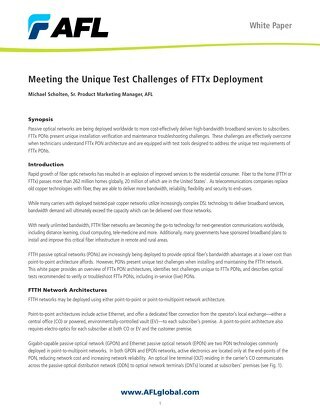 FTTx PONs present unique installation and maintenance troubleshooting challenges. 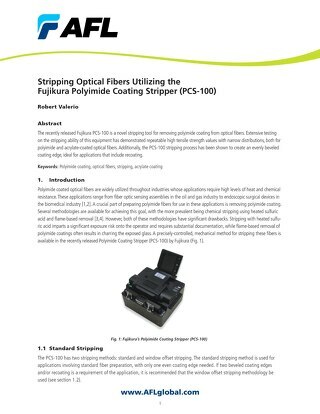 The recently released Fujikura PCS-100 is a novel stripping tool for removing polyimide coating from optical fibers. Your network is important. Making sure your connector is cleaned and inspected can prevent the need for costly maintenance in the future.